Several teams dominated the headlines at the start of the 2016 MLB season. The new and improved Chicago Cubs looked poised to make another deep playoff run, the San Francisco Giants were entering an even year, the New York Yankees were new owners of the most feared bullpen in the league. Some of those expectations are still in tact - the Cubs are in first place in the NL Central, the Giants own the best record in the National League, and the Yankees (for the time being) still control the lockdown trio of Dellin Betances, Andrew Miller and Aroldis Chapman. This season hasn't been without its big surprises, either. Perhaps the biggest of them all has been the Cleveland Indians, who have established a comfortable lead atop the AL Central and appear bound for their first postseason in three years. The Indians' notable first half has allowed the team to experience increasing resale prices for MLB tickets at Progressive Field through the end of the regular season, making them one of just eight teams to see a bump in average price at home since mid-March. The above graph shows each team's movement in terms of average ticket price at home since the beginning of the season. The Cubs and Toronto Blue Jays have experienced the biggest increase in average price since March, with Cubs tickets on the secondary market jumping 15% from the $152.08 average on March 9 and to $174.94 four months later. Despite their struggles early, the Blue Jays have pieced together a solid season and sit 10 games over the .500 mark. Such a strong recent showing has helped ticket prices on the resale market, with Blue Jays tickets also jumping nearly 13% on average between March and July. Two teams have remained relatively unchanged over the last month. The Washington Nationals have cruised atop the NL East, aided by the career year both Daniel Murphy and Wilson Ramos are having. Still, despite their first-place play, Nationals tickets at Nationals Park have actually decreased in average price, albeit very minimally (less than a $1 difference). Milwaukee Brewers fans have also found limited change on the secondary market, dropping less than $1 in average price over the last four months. As for the remaining 20 teams, each has experienced a drop in average ticket price at home since Spring Training began in March. The most notable has been the Chicago White Sox, whose hot start was followed by a dismal May and June. As it stands now, White Sox tickets on TicketIQ average $58.74, down 35% from the $90.50 average the team posted back in March. Other teams that have experienced a major dip in average ticket price include the Texas Rangers, who despite their first-place play in the NL West continue to see falling resale prices. 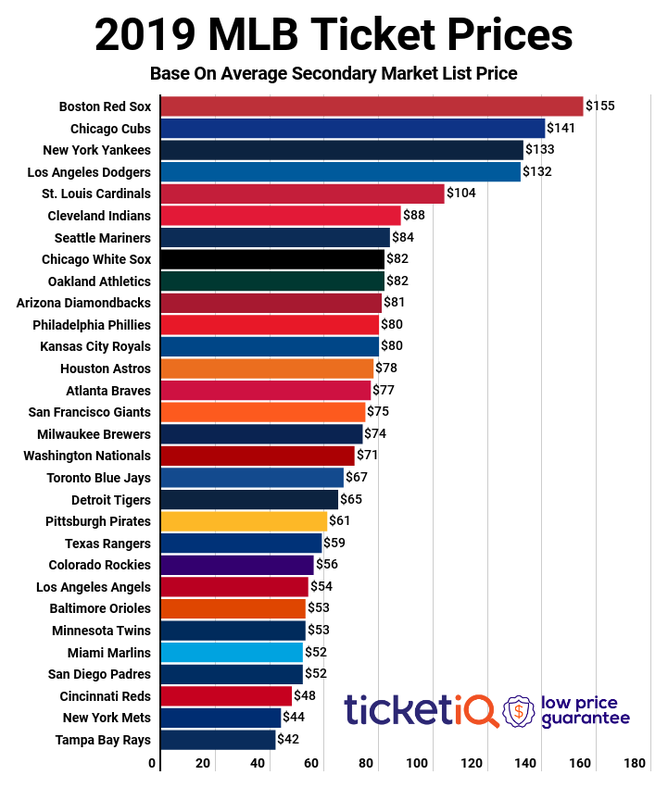 On March 9, Texas Rangers tickets for the 2016 season were averaging $146.16 on the secondary market. Four months later, tickets now own an average price of $109.34, more than a 25% drop. The Detroit Tigers have been near identical to that of the Rangers, falling 24.6% from a $150.42 average on March 9 to $113.38 on July 19.